Zebu are sometimes known as indicine cattle, humped cattle or Brahman is a species or sub-species of domestic cattle originating in South Asia. Zebu are characterised by a fatty hump on their shoulders, a large dewlap and sometimes drooping ears. 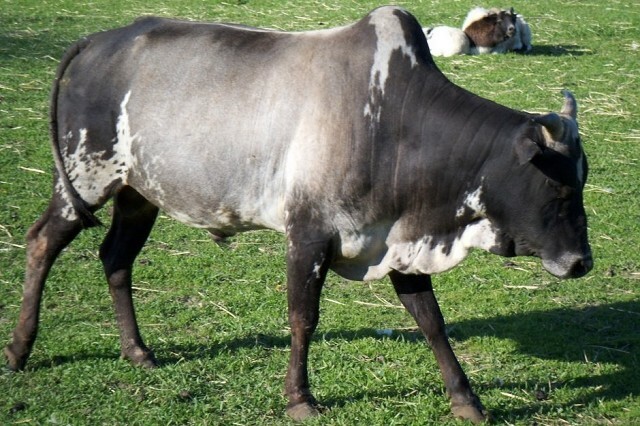 They are well adapted to withstanding high temperatures, and are farmed throughout the tropical countries, both as pure zebu and as hybrids with taurine cattle, the other main type of domestic cattle. Zebu are used as draught oxen, as dairy cattle and as beef cattle, as well as for byproducts such as hides and dung for fuel and manure. In 1999, researchers at Texas A&M University successfully cloned a zebu.